The latest Harry Potter movie has become the most successful film in UK cinema history, making £14.9m in three days, according to its distributor. Warner Bros Pictures says the film beat the final Star Wars movie, Revenge of the Sith, which took the same amount but over four days earlier this year. 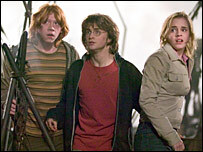 The company says the Potter film has taken $181.4m (£105.3m) since it opened in 21 countries on Friday. It took the fourth highest-ever amount for North America, $101.4m (£58.8m). Official figures for the UK box office are due to be released on Tuesday. If Warner Bros' figures are confirmed, it will mean the film has beaten the Revenge of the Sith's record, set in May. The sixth Star Wars movie beat the £11.4m made by its 2002 predecessor, Attack of the Clones, in its first four days of release. 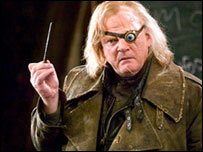 The Goblet of Fire was number one in every country where it opened, claims Warner Bros. The film opens in Japan, Italy and Spain next weekend, while fans in France and Australia will be able to see it in the first week of December. Its UK success comes despite the film receiving a 12A certificate rather than the PG rating given to the first three, because of its "moderate fantasy violence, threat and horror". The rating means under-12s have to be accompanied by adults when they see the film. The film was rated PG-13 in the US rather than the milder PG given to its predecessors for similar reasons. The rating warns parents some scenes may be unsuitable for under-13s. The US takings surpass the previous record for a JK Rowling adaptation, the $93.7m (£54.4m) opening weekend receipts for last year's Harry Potter and the Prisoner of Azkaban. Spider-Man holds the all-time US record, having taken $115m (£66.8m) in 2002, while Revenge of the Sith began with $108.4m (£63m) earlier this year, just ahead of Shrek 2's $108m (£62.7m). Elsewhere in the US and Canada box office, the Johnny Cash biopic Walk the Line was second after taking $22.4m (£13m) in its first weekend, while Disney cartoon Chicken Little fell from the top spot to third. Harry Potter star Daniel Radcliffe has become Britain's richest teenager, according to the Sunday Times. Records at Companies House show that Gilmore Jacobs, the firm set up five years ago by Radcliffe's parents to manage his earnings, earned £10m from the first three Harry Potter films. "I don't actually know how much I am worth at this point," the 16-year-old said last week. "It's not something that affects the way I think about things."